Tags: DIY Home, DIY Projects, Home and Decor, Home Improvement, Knock It Off! DIY Projects, Knock It Off! Love the look of stone and granite, but can't afford the high price tag? Here's how to create the look for less with a faux stone exterior and a granite-look-alike laminate countertop in this easy DIY bar project. These fake stone that look and feel so real, you'd never know they weren't, except the project won't empty your bank account. 1. Measure your bar area to determine how much faux stone you need. The product we used (which came from a home improvement store) covered 8 square feet, so we needed two boxes and two tubs of adhesive. 2. Apply adhesive to the back of the stone using a putty knife. Be generous - think of frosting a cupcake, not buttering toast. 3. Starting at the bottom corner, press the stone to the wall and apply pressure for a few minutes. 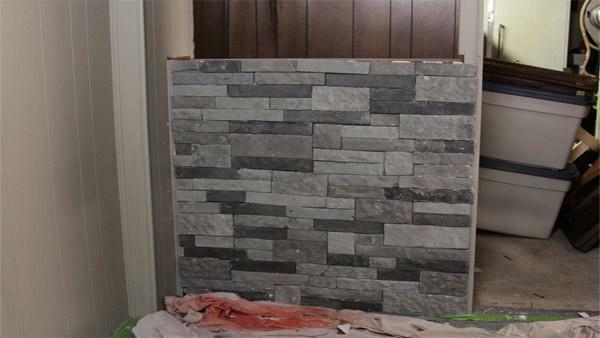 While the adhesive is still wet, level the stone to make sure each layer is straight. This is especially important on the first few rows. 4. Alternate the shape and style of the stone as you go for a random, stacked stone look. If you get adhesive on the stone, wipe clean immediately with a damp cloth. 5. You may have to make cuts on some of the end pieces, which is easy to do, even without powertools.. Mark the stone where you need to cut it and used a hacksaw to cut it down to size. 6. Let dry the recommended length of time and then get to work enjoying your new bar. You've earned it!